Splendid, Strange, Intricate, Colorful, Delicate. 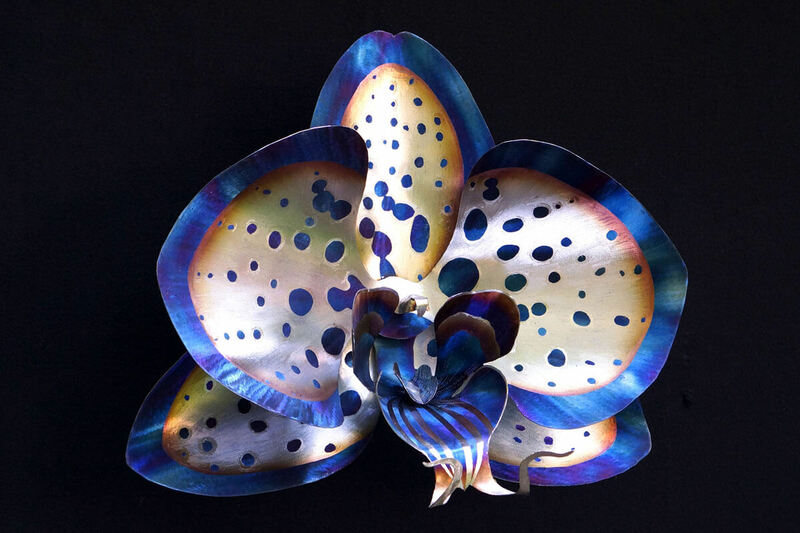 This 24” orchid flower is a handmade wall hanging metal sculpture that is created entirely from stainless steel. 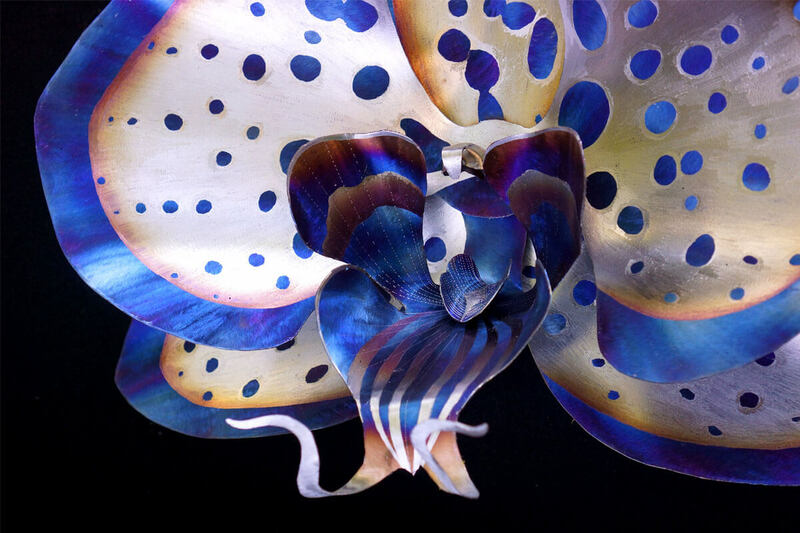 This bloom is based of of the Phaleonopsis orchid flower which I have always found to be incredibly beautiful. The bilateral symmetry is quite intriguing and the delicate complexity mixed with vibrant colors is stunning to me. I made an 11 inch version a little while back and it was fun to redesign the phaleonopsis to be larger because it required a keen eye to intricacy as the larger size requires more detail and precision in order for it to read properly. 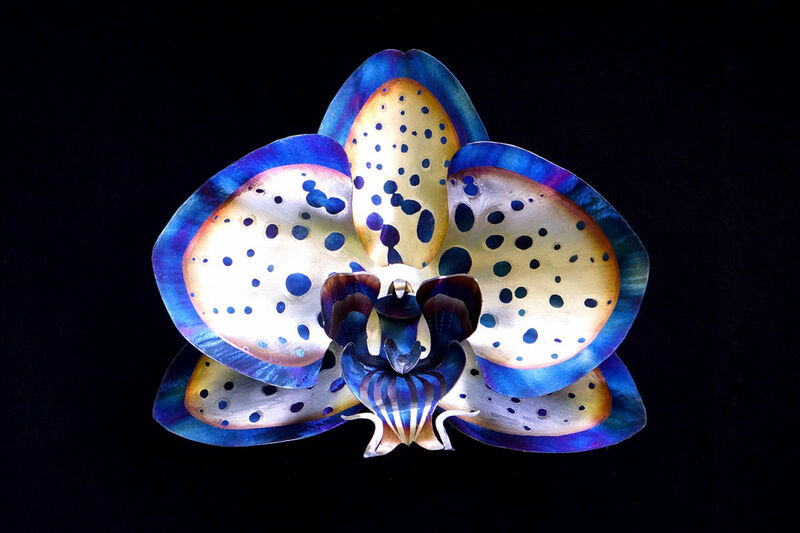 This orchid was a unique challenge as I colored the entire flower blue with a heat patina then I had to come back with my little pencil grinder and hand grind out little dots and splotches. I decided to leave a blue rim to root the piece as a whole and allow it to feel more balanced. After grinding was complete something wasn’t quite right. The delineation was too evident so I came back and lightly colored the line between the blue edge and white which really helped blend the piece together and created a very satisfying effect! This sculpture is completely safe to be kept outdoors! Large blue spotted orchid flower. 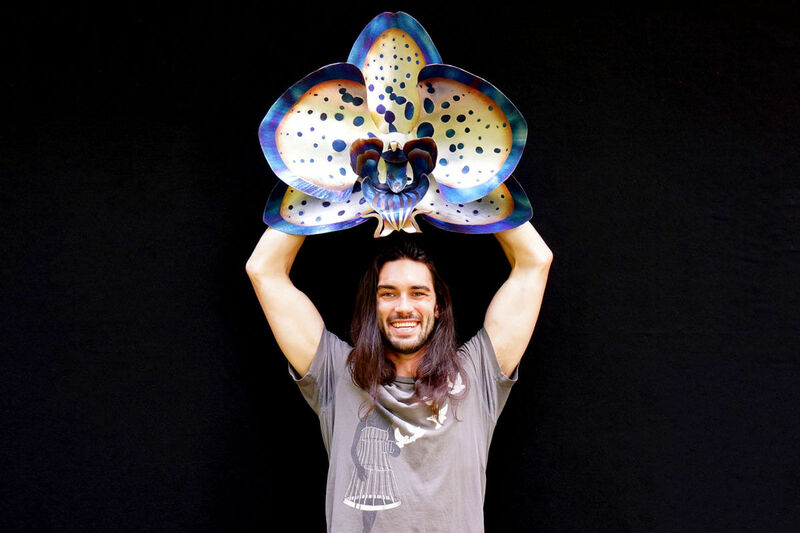 Artist Aiden Dale with large blue spotted orchid flower. Tilted large blue spotted orchid flower. Close up of large blue spotted orchid flower.